After the fire of 1834, new buildings were needed to house Parliament. Charles Barry's design was selected as the best submitted in the specified Gothic or Elizabethan style. Barry was a Classical architect and enlisted the Gothic revivalist Augustus Welby Pugin to aid him in the design. 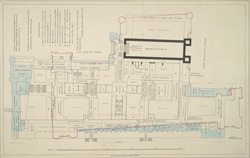 This is a plan submitted by Barry, with alterations suggested by the Commissioners.